To view our current inventory of 5 Ball spadroons, swords and other antique weapons, click here! 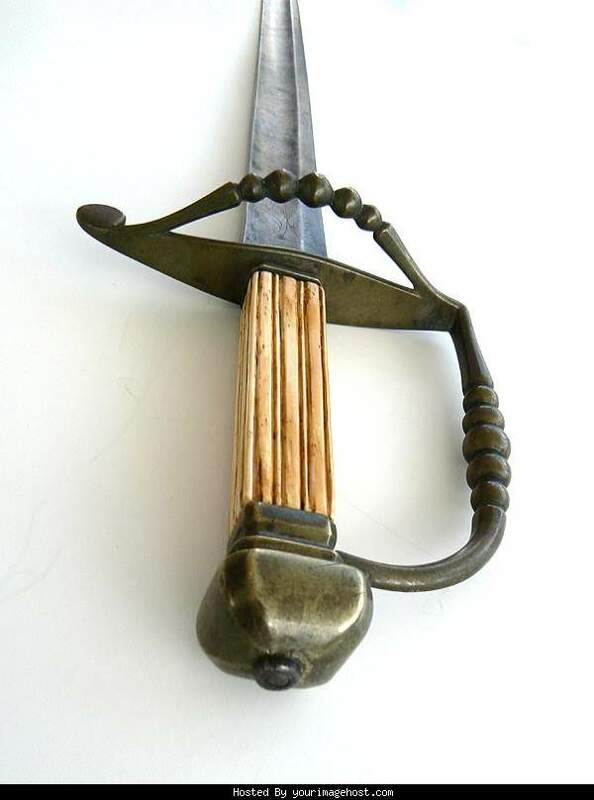 Presented is a style of sword that found favor, for a very brief 30 year period between 1790 and 1820 with Naval and military officers in England, France and America before regulation swords became prevalent. The straight, cut and thrust Spadroon's, single edge blade measures 32 1/2 inches in length, 38 1/4" overall, making it likely for a mounted officer. It is 1 1/8" wide, 1/4" thick, with a 3/4" fuller that runs almost to the spear point tip. 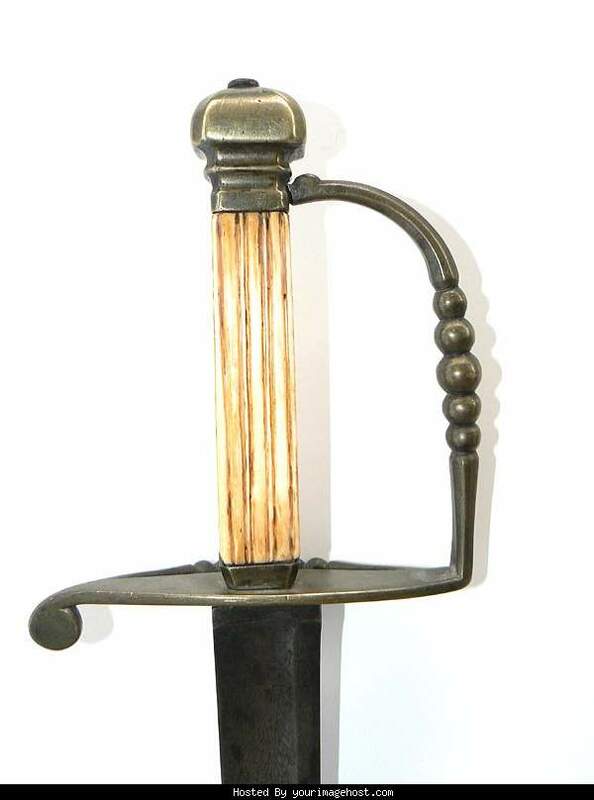 It has the highly desirable and scarce 5 ball cross guard and 5 ball knuckle guard bronze hilt with reeded cattle bone grip. 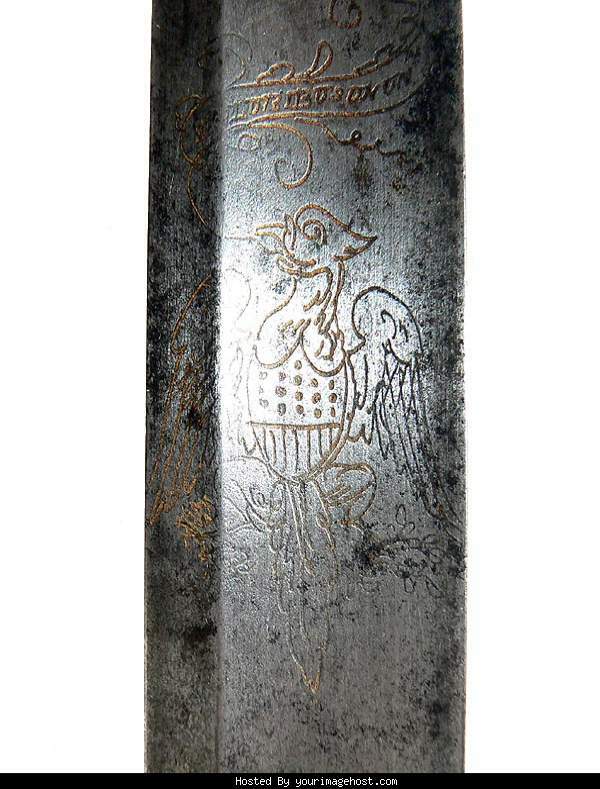 The name of Richards Upson, New York is imprinted within a scroll on the obverse, and on the reverse there is a spread U.S. Federal eagle with shield which is marked E. Pluribus Unum in a banner definitely making this sword for use in America. Other engraved embellishments covering the first 12 1/2 inches, front and back, include a flag on staff and quiver of arrows and numerous floral scrolls. 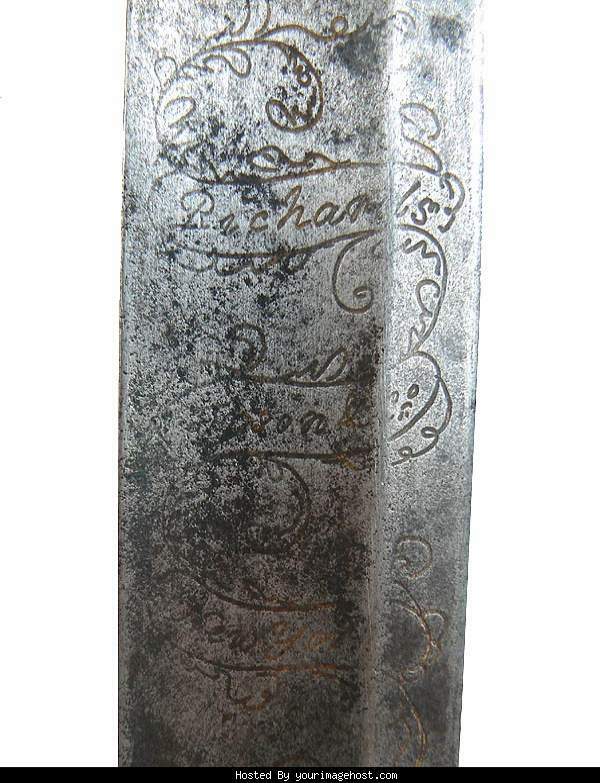 Richards Upson operated at 145 Pearl St. in New York City from 1808-1816, and were well known arms merchants during this limited period which dates this sword. 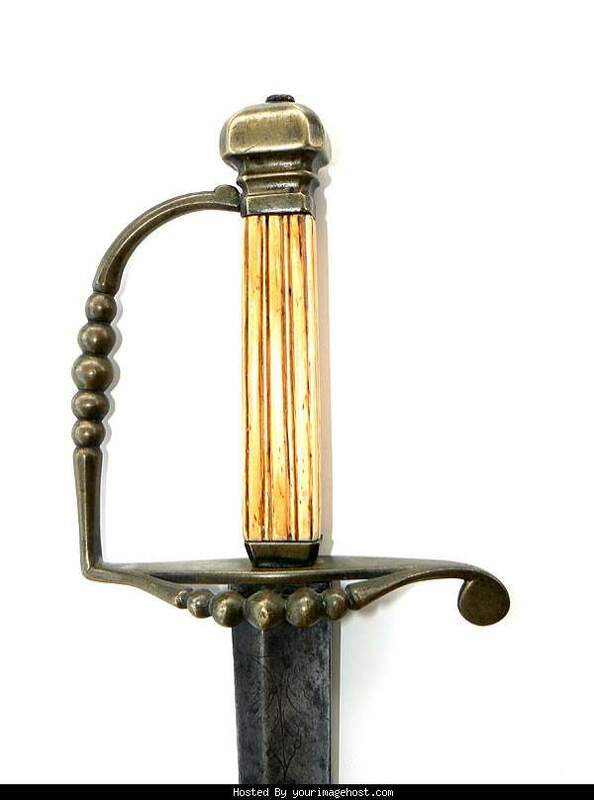 CONDITION: The sword is in remarkable condition with excellent engraving on the blade and a magnificent and complete 5 ball hilt with reeded bone grip. The engraving is sharp and legible. The blade has varying shades of grey with darker splotches of age along its length. There is very minor pitting, but only along a few places on its upper and lower edge. There is no evidence of bluing or gold wash remaining. The pillow tang stands proud and is secured by a round nut. All the sword's fittings are tight. There is no scabbard. 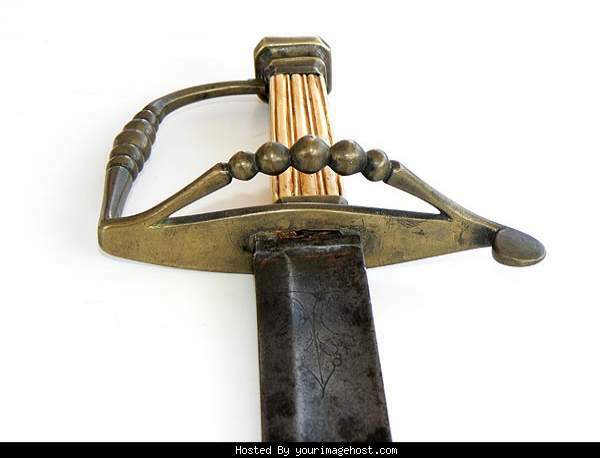 PROVENANCE: This type of weapon, which was highly popular for a limited 30 year period beginning in 1790 by military and naval officers in England, France and the United States. It is well documented in various sword collecting books such as Bill Bezdek's, “American Swords & Sword Makers“ with photos on page 291, and arms-maker, Richards Upson, is listed on page 142. Peter Tuite in his “U.S. Naval Officer's, Their Swords and Dirks” devotes 9 pages starting on page 18 of 5 Ball swords with Pillow Pommels of this type. International buyers welcome, but must inquire first. You are responsible for knowing the your country's laws. We have satisfied customers in Argentina, Australia, Austria, Belgium, Bermuda, British Virgin Islands, Canada, Chile, China, Czech Republic, Democratic Republic of Congo, Denmark, Estonia, England, France, Germany, Greece, Holland, Hong Kong, Hungary, Iceland, Ireland, Israel, Italy, Japan, Kuwait, Latvia, Martinique, Mexico, New Zealand, Norway, Nova Scotia, Panama, Poland, Portugal, Puerto Rico, Romania, Saudi Arabia, Scotland, Singapore, Spain, Sweden, Switzerland, Thailand, Turkey, United Arab Emirates, USVI and the Eastern Caribbean.